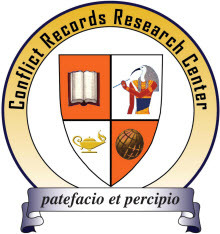 There is a new opening for a Research Analyst at the Conflict Records Research Center (CRRC) at the National Defense University. The vacancy notes that the CRRC "was established to fulfill the Secretary of Defense's intent to enable research into captured records with 'complete openness and rigid adherence to academic freedom and integrity.'" Duties include providing research support to Director and staff at CRRC, serving as "IT/digital archive expert and local network administrator," producing research finding aids, and working with "various U.S. government agencies and contractors on issues involving the transfer, translation, validation, and provenance of records." Requirements and full description are here. Application period closes on February 10, 2012.